An active, graceful, well-balanced dog, very gay, and free in action. Fearless and sporting in character yet at the same time gentle and affectionate. Blenheim: Bright chestnut red markings well broken up on a pearly white ground. The red on the head must extend around the eyes as well as down over the ears. A pure white muzzle is preferred. There must be a distinct white blaze between the eyes. Between the ears may be the lozenge or spot unique to the Blenheim, which is a highly desirable, but not essential, characteristic. Tri-Colour: Jet black markings well broken up on a pearly white ground. The black on the head must extend around the eyes as well as down over the ears. There must be a distinct white blaze between the eyes. A pure white muzzle is preferred. Rich tan markings appear over the eyes, on cheeks, inside ears, under the tail and around the vent. Tan should appear inside the legs where it is adjacent to black. Black and Tan: White marks are undesirable. Jet black with rich tan markings over the eyes, on cheeks and muzzle, inside the ears, on throat and chest, on forelegs from knees to toes, on the inside of the hind legs also extending from hocks to toes, on the underside of the tail and surrounding the vent. White marks are undesirable. Long, silky and free from curl, though a slight wave is permissible. Feathering on ears, legs and tail should be long, and the feathering on the feet is a feature of the breed. In our opinion, you can’t find a more affectionate “lap dog” in the world. They love life, kids and food! Their wonderful personalities are offset by unreliable obedience, especially off leash, and their profuse shedding. 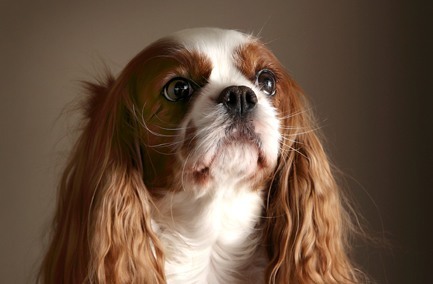 Despite their tendency to develop heart disease as they age, we recommend Cavaliers to anyone who wants an adoring soul at their feet or on their lap.